ASM List - What to do in ASM list Stocks? 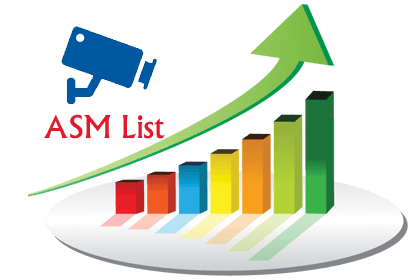 Home » Stock Market » ASM List – What to do in ASM list Stocks? ASM List – What to do in ASM list Stocks? The ASM list has created havoc in the stock market. All shares listed under ASM list are declining sharply. Investors are worried and directionless. They are wondering about what to do in ASM listed stocks? If your portfolio also contains ASM shares and you need help about decoding term ASM and precaution you should take here is complete information about ASM including ASM list. ASM is Additional Surveillance Measures. It is a new category formulated by SEBI to check market manipulation. High-risk stocks are placed under ASM list. Let’s try to understand this by example. Graphite India is a multibagger stock. Graphite India has given exceptionally high returns to the investors in past one year. On 31st May, 2017 stock price of Graphite India was Rs.115 and on 31st May, 2018 price of Graphite India was Rs.888. This means in last one year this stock has given 672% CAGR return to the investors. Graphite India is now placed under ASM list. Similar to Graphite India there are other multibagger stocks such as HEG, Dilip Buildcon which are placed in ASM list. You must be thinking why multibagger stocks are placed in ASM list. The stocks that follow simple criteria such as price volume spike is put under watch. Apart from that if a stock price is not justifying fundamentals it is put under ASM list. ASM list is released by BSE and NSE as per SEBI’s guideline under ASM framework. The intent is to keep the Indian equity markets safe for investors and check undue volatility in stock prices. The exchange will review these stocks on a bimonthly basis and make the changes as per ASM framework. The shortlisting of stock under the framework is only on the account of surveillance it is not a disciplinary action against the company. How ASM affects Investors and Traders? After getting complete understanding about ASM let’s try to understand how ASM affects stock market investors and traders. Intraday trading in ASM listed stock will be very difficult. Trader dealing in such stocks have to deposit 100% margin, and these counters attract 5% circuit filter. This means stock price in such stock cannot go up or down by more than 5%. This means traders have limited profit or losses. One can sell shares if it is lying in the demat account. For investor it is bad news. Due to negative bias, these type of stocks are likely to fall. Existing investors profit will be negatively impacted. If you are long-term investors you need not worry about such short-term fluctuation or negative news. The ASM measures helps uninformed investor as it reduce speculation in the stock market. Note above list is as on 17th Jan 2019. You can find the latest list on NSE website. What investor should do in ASM Listed Stocks? ASM is good for the long-term investors. There can be short-term panic in ASM listed stocks but it is good for quality stocks as it eliminates speculations. If you have ASM listed stock in your portfolio don’t get panic. Follow the steps given below. Avoid Fresh entry in ASM listed stocks. Due to trading restriction stock price is likely to go down further. Study fundamentals of the stock. If fundamentals of stocks are good to stay invested in the stock. If required take help of a stock market expert. If fundamental of the company is bad then try to exit as early as possible. Also Read – How to analyze the fundamentals of the company? I hope the information given above on ASM list will be helpful to the investors. What is your take on the ASM list? « How to Download Aadhaar Update History from UIDAI website? Thanks a lot for such a nice and informative article. Thank you so much for educating us.